The Euro-to-Dollar rate is to begin trading around 1.1324 Sunday after rising one cent in the previous week, although with the market price having fallen below a key moving-average of late, the outlook is an uncertain one for the days ahead. The Euro outperformed the Dollar after U.S. durable goods orders growth slowed further than was expected during January, prompting renewed concerns about a possible slowdown in the U.S. economy. From a technical perspective, the pair continues to bob around in the same narrow range it has been trading in since November 2018. However, it is now trading below the 200-week moving average (MA), which has clouded the outlook for the pair. EUR/USD fell below the 200-week average at the beginning of March after the European Central Bank (ECB) put plans for a 2019 interest rate rise on ice, citing a marked slowdown in growth over the last 12-months. The pair has since recovered - rising back up to the 200-week moving-average but it has not yet overcome it and the market's proximity to this threshold may lure more sellers off the sidelines this week. However, the convergence of the RSI momentum indicator in the bottom panel of the charts, with the market price, is a bullish indicator so the outlook if far from clear cut. The daily chart shows the evolution of a falling trend channel that suggests scope for a move up to the 50-day moving-average at 1.1363. However, it also flags that there's a danger of a reversal lower once up at these levels given the thick ceiling of resistance. Above: Euro-to-Dollar rate shown at 4-hour intervals. The 4-hr chart further complicates the outlook. The rise since the March 7 lows could be a new short-term uptrend. For example, it is already showing two sets of higher highs and higher lows which is the first sign of the birth of a new uptrend. If so, it suggests it is biased to extend that trend higher. Another bullish feature is that it has possibly formed a bull-flag pattern during the rise. Bull flags are made up a steep rallying phase during the formation of the ‘pole’ and then a sideways consolidation phase during the formation of the ‘flag square’. A break above the highs of the flag usually confirms a continuation higher which is of the same distance as the length of the pole extrapolated higher. In this case it suggests a target at around 1.1450. One problem is that the bull flag hypothesis clashes with the bearish falling channel hypothesis on the daily chart, and for the flag to unfold it would have to break above the top of the channel as well as the 50-day MA, both of which are likely to be difficult to breach. A move above 1.1350 would confirm a breakout of the bull flag with a target at 1.1450, but for confirmation of a breakout of the channel and the MA as well, a move above a higher confirmation level at 1.1390 or so would be required. The main release in the week ahead for the Euro is March manufacturing and services sector PMI data, out on Friday at 9.00 GMT. PMI’s are an important leading indicator which provide a preview of what hard data is likely to show. This is amply illustrated in the chart below which shows how the Eurozone composite PMI closely tracks Eurozone GDP. PMI’s are surveys of key purchasing managers in companies, who tend to have access to a privileged perspective and are thus able to more accurately gauge the health of the company and industry sector they are in. Given the slowdown in Eurozone GDP noted in 2018 and the beginning of 2019 investors will be eager to see what the results are for the most recent surveys in March. Consensus expectations are for the composite PMI index to rise to 52 from 51.9, for manufacturing PMI to rise to 49.5 from 49.3 previously, and for services PMI to fall to 52.7 from 52.8. A result of over 50 indicates expansion and below contraction. Another key business survey, the ZEW, is out on Tuesday at 10.00, and is forecast to show a dip in Eurozone. The main event for the U.S. Dollar is the meeting of the U.S. Federal Reserve (Fed), which ends on Wednesday, March 20. Since no actual change in interest rates is foreseen, the main focus will be on the Fed’s economic forecasts, the updated dot-plot diagram which shows the Fed’s expectations for the future course of interest rates, and the commentary of Fed Chairman Powell. The market is currently not expecting any further interest rate rises from the Fed in 2019. This contrasts with the Fed’s own projections based on the dot-plot which sees them making roughly two more interest rate hikes in 2019. There is a risk, however, that the Fed could revise down their dot-plot - which hasn't been updated since December - more in line with market expectations, and that this could precipitate a decline in the Dollar. 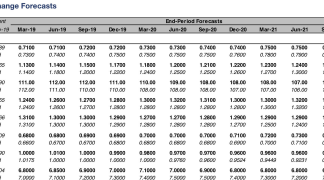 Individual Fed member’s comments in 2019 indicate a shift in stance towards a more ‘wait-and-see’ stance which could precede a change in the official dot-plot on Wednesday. “Policymakers sent a clear signal that they won’t touch the hiking button again for at least a few months, or perhaps not at all, depending on how risks evolve – most notably the slowdown in US and global growth. The message was well understood by traders, with market pricing for rate hikes in 2019 evaporating instantly. In fact, futures markets now indicate a modest probability for rate cuts this year, not hikes,” says Marios Hadjikyriacos, an economist at FX broker XM.com. PMI’s are surveys of purchasing managers within companies. Given current concerns about U.S. growth, investors will be eager to see what the results are for the most recent PMI surveys in March. The market expectation is for manufacturing PMI to rise to 53.7 from 53.0, and services to remain unchanged at 56.0. A result of over 50 indicates expansion and below contraction. Factory Orders in January is expected to show a rise of 0.3% from 0.1% previously when it is released at 14.00 on Tuesday. The Philadelphia Fed manufacturing index is forecast to show a rise to 5 in March from -4.1 previously, when it is released at 12.30 on Thursday. Slowdown fears relating to the U.S. housing market will be brought into focus on Friday when existing home sales data for February is released and forecast to show a 2.2% recovery after falling -1.2% in the month before.